apreet assists you to meet the people you know anywhere you go to grow your business. The people we know give us access to new opportunities. With apreet you will meet more people in your network, meet more opportunities and seize the best ones. Whom will you meet next week? You never know who you’ll run into in your travels. But why rely on coincidence? 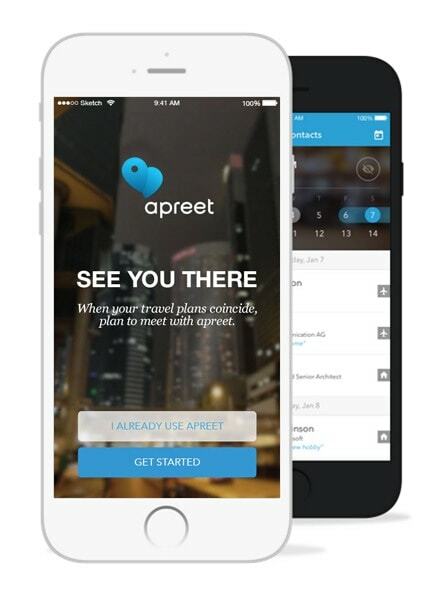 apreet compares travel plans within your professional network and alerts you when they coincide before you take-off — so you can simply plan to meet. People that are in the people business, or just anybody who enjoys the company of friends and contacts, people that have traveled a lot in the past or are still traveling frequently. Contact lists, business networks, calendars are all important tools, but they could be so much more. By combining the three and placing people in the center our ambition is to change the way we live our relationships, have a good time together and learn about new ideas and opportunities. Travel responsibly. If you are traveling apreet helps you to get the most out of your time. In the future, we want assist you in saving entire trips. Appstatic. Daniel architects apps since 2010 – including some rated 4.5 stars (best in class) totaling more than 5M downloads. Co-built Europe’s largest photo‑rating site and community. Co‑founded M‑Squad, a mobile services consultancy and MobileMonday Germany, part of a global community of mobile professionals. Daniel: “In life people matter most. apreet will enrich and inspire our lives”. ‘Calin’ has been programming since the age of 12 starting with an HC 85 and a tape recorder to load Basic games. For the last 10 years he has worked on many software projects, co-founded a start-up and his own software studio. Passionate about programming (duh! ), violin, biking, rock climbing, meditation and a vegetarian wannabe.